“O people! A month has approached you laden with blessing, mercy and forgiveness; it is a month which Almighty Allah regards as the best of all months. Its days, in the sight of Almighty Allah, are the best of days, its nights are the best of nights, its hours are the best of hours. It is a month in which you are invited to be the guests of Almighty Allah and you are regarded during it as worthy of enjoying Almighty Allah’s generosity. Your breathing in it is regarded as praising Almighty Allah and your sleep as adoration, and your voluntary acts of worship are accepted, and your pleas are answered. Therefore, ask Almighty Allah your Lord, in sincere intentions and pure hearts to enable you to fast during it and to recite His Book, for only a wretch is the one who is deprived of Almighty Allah’s forgiveness during this great month. And let your hunger and thirst during it remind you of the hunger and thirst of the day of resurrection. Give alms to the poor and indigent ones among you; surround your elderly with respect, and be kind to your youngsters. Visit your kin and safeguard your tongues and do not look at what Allah has decreed as prohibitive for you to look at, and do not listen to anything your ears are forbidden from hearing. Be kind to the orphans of others, so that your own orphans will equally receive kindness. Repent your sins to Almighty Allah and raise your hands to Him in supplication during the times of your prayers, for they are the best times during which Almighty Allah looks with mercy to His servants and answers their pleas when they plead Him. O people! Your souls are pawned by your deeds; therefore, release them by seeking Almighty Allah’s forgiveness. Your backs are over-burdened by the weight of your sins; therefore, lighten their burden by prolonging your prostration. Be informed that the Exalted and Almighty Allah has sworn by His Dignity not to punish those who say their prayers and prostrate to Him, and not to terrify them by the sight of the fire when people are resurrected for judgment. “O People! Whoever among you improves his conduct during this month will have a safe passage on the right path when many feet will slip away, and whoever among you decreases the burdens on his servant, will be rewarded by Almighty Allah decreasing his reckoning. Whoever among you abstains from harming others will be spared the Wrath of Almighty Allah when he meets Him. Whoever among you affords generosity to an orphan will be rewarded by Almighty Allah being generous to him on the day of judgment. Whoever among you improves his ties with his kin will be rewarded by Almighty Allah including him in His mercy, and whoever among you severs his ties with his kin, Almighty Allah will withhold His mercy from him when he meets Him. Whoever among you offers voluntary prayers, Allah will decree a clearance for him from the torture of the Fire. Whoever among you performs an obligation will receive the reward of one who has performed seventy obligations in other months. Whoever among you increase the sending of blessings unto me, Almighty Allah will make the balance of his good deeds heavy when balances will be light. Whoever among you recites one verse of the Holy Qur’an will receive the blessing of one who recited the entire Qur’an in another month. 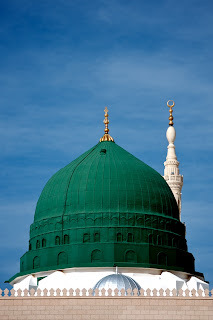 May deep peace and blessings of Allah be upon our liege lord Muhammad Mustafa, the chosen beloved of Allah, and may our life be successful and accepted in following his blessed footsteps. Ramadan Khutbah delivered by Prophet Muhammad as narrated by his companions.